This last weekend saw the move to British Summertime, but before April even began there have been to many Tuff achievements to fit into one round up. Therefore this first part covers all things swim related and the second part covers mention of biking and running. We did the first 5k at Arun Leisure Centre Saturday afternoon. We were then due to do the second one at Westgate a couple of hours later. I wasn’t well enough on the day to do that second one (stupid cancer! )… Claire did do her second one that night. I was feeling better by the next day and so on Sunday we both did the final session at ALC – Claire’s third and my second. Editors note: The brilliant news is that Helen did return on the Tuesday and completed her 5k to chalk up the triple. An inspiring achievement; Claire acted as lane buddy and our very own Tony Morgan made sure a lane was kept for her. 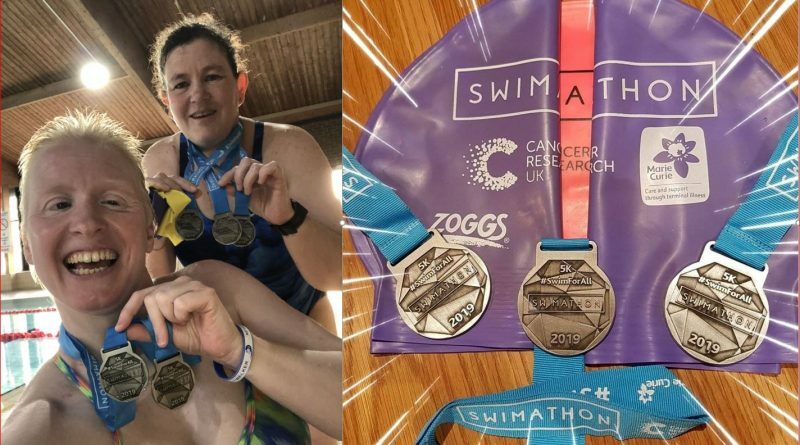 “So amazed and very pleased to have completed the Swimathon Triple 5k Swims. My first was at Steyning on Friday lots of people taking part, a few late entries that the venue didn’t know about so ended up with loads of swimmers in each lane. Lane counters provided, and some nice fruit at the finish. My Second was at Wadurs on Saturday, not so busy this time. No lane counters, thankfully Hubby was on hand. 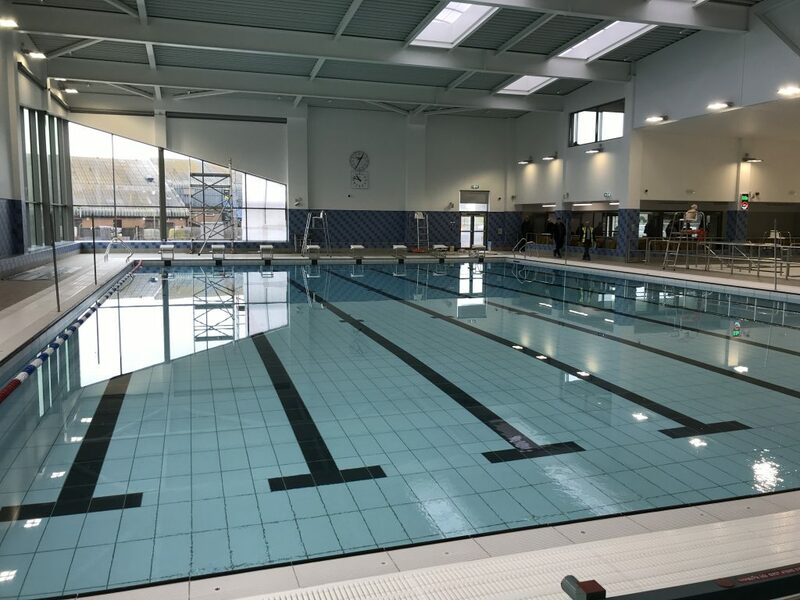 My Third was at Littlehampton Wave on Sunday and a chance to swim in the New Pool. Not to many swimmers so I was lucky to get a lane on my own, no lane counters so hubby stepped in again. A triple 5k facebook page was set up by Laura Jane who I met at Steyning, so keeping in touch with such a great group of supportive swimmers made my weekend amazing. 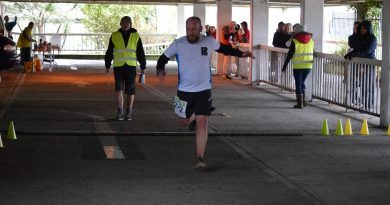 Tiff Orton also swam:- “A last minute decision that definitely worked in my favour as I entered the individual 5km in Littlehampton which ended up being in the New pool. Swimming 200 lengths is boring (theres no way to sugar coat it!) but I decided to try and keep count myself with my watch as a back up. A warm a fuzzy feeling knowing I had also contributed to Cancer Research and Marie Curie charities. Would I do it again….. course I would! Congratulations also to Coach Kev Pearson putting into practise what he teaches us every week with a great swim. “Most of the time in life you get what you deserve, sometimes you don’t get what you deserve & sometimes you get what you don’t deserve – in the very rare event you get something positive you don’t deserve you should grab it with both hands & not let go. 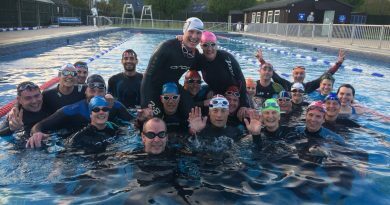 The Kent v Sussex Relay Challenge match is in its second year – 45+ events involving male & female swimmers from all Masters Swim age-groups (18-70+) held over a 90 minute competition with two teams (A & B) from each county battling it out for two shields. Three months into recovery (?) of a supraspinatus/impingement injury was not the ideal time to get a call up to swim for the County but as long as the arm remained attached to the shoulder I was not about to pass up on the opportunity. I have to admit that I felt a bit of a fraud, I didn’t even swim the basis of selection event at the 2018 Counties but I wasn’t about to own up. All I wanted to do was finish – times weren’t important as long as I didn’t embarrass either myself or the Team. County cap & match t-shirt collected, it was time to mingle & pretend to be a proper swimmer. Scheduled to swim 3 events as the (crocked) old man of the relay, final leg apparently – so no pressure whatsoever. Race 1 – took over in front, finished behind. Not going well. 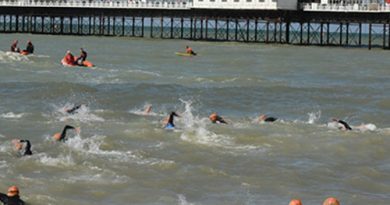 Races 2 & 3 – swimming against the same Kent B member, more help needed from team mates, please! Thankfully more help was granted , my private duel finished 2-1 (go me) helping Team Sussex Blues to victory over Kent Whites by a 7 point margin. Times weren’t important as the team result was what mattered & shoulder meant there were no expectations of anything other than the hope of success by ducking under 35 seconds. Official results revealed an astonishing 32.2 average for the 3 swims with a gob-smacking 31.5 in the 2nd race. Perhaps I am not so injured as the body has been making out & this season won’t be the washout I have been fearing. Have you recently spruced up your bike for the summer? have you got any inner tubes to throw out? We could do with a few more to cut up to add to our stock of swim bands around the ankles to use for technique during our pool swims. Yes? great, please bring along to a swim session – thank you.